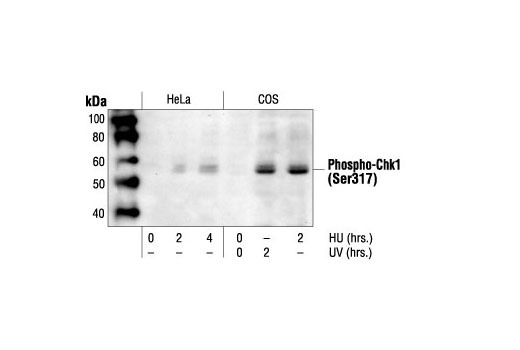 Western blot analysis of extracts from HeLa and COS cells treated with HU or UV as indicated, using Phospho-Chk1 (Ser317) Antibody. Western blot analysis of extracts from Mv1Lu cells treated with UV or HU as indicated, using Phospho-Chk1 (Ser317) Antibody. 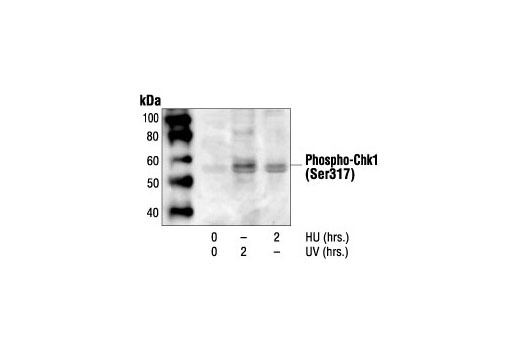 Phospho-Chk1 (Ser317) Antibody detects endogenous levels of Chk1 only when phosphorylated at Ser317. The antibody does not recognize Chk1 phosphorylated at other sites. Polyclonal antibodies are produced by immunizing animals with a synthetic phosphopeptide corresponding to residues surrounding Ser317 of human Chk1. Antibodies are purified by protein A and peptide affinity chromatography.